Photonic supports authentication for all providers with the exception of native WP that has no concept of private photos, and Zenfolio, which has authentication, but for which Photonic only supports password-protection. 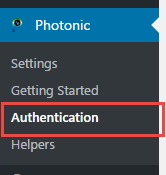 Front-End / Client-Side Authentication – This is supported by Photonic for Flickr, Picasa, SmugMug and 500px. 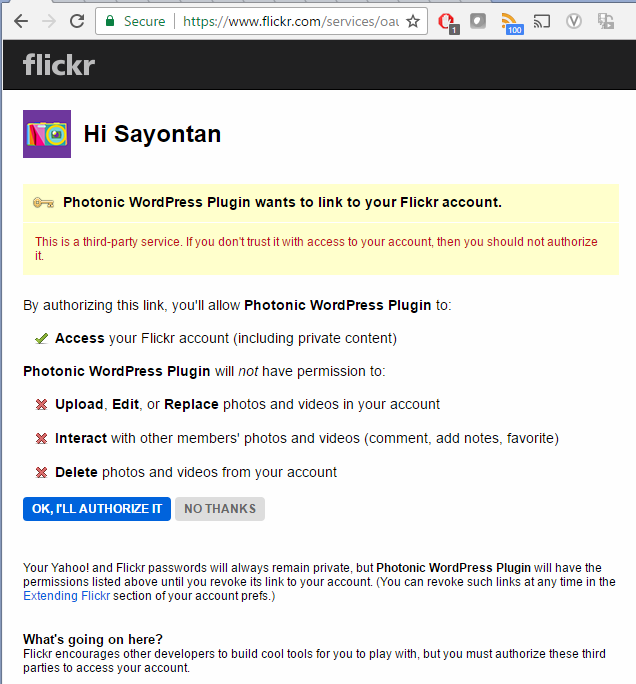 Back-End / Server-Side Authentication – This is supported by Photonic for Flickr, Picasa, SmugMug, 500px and Instagram. If the user logs in, the content that the user is authorized to see will be shown. To set up Front-End Authentication go to the settings page for your respective provider. Flickr is used as an example here, but the settings are consistent across all supported providers. You would typically use front-end authentication if you want the visitors of your site to see only what they are allowed to see outside the WP environment. Certain providers such as Instagram and Google (Picasa) put up extreme barriers around photos, causing everything to require authentication. Instagram has a horribly written API and an even more asinine way of granting access, all in an attempt to pass the buck to overcome inherent flaws in its security. And Google went from an open model that was present in PicasaWeb to a walled garden with Google Photos. To get around the shortcomings of such providers Photonic brings in server-side, or back-end authentication. In this case, you do the authentication (not your site’s visitors), and your visitors see what you are authorized to see (instead of what your visitors are authorized to see). For Instagram see here. You will need at least version 1.59 of Photonic for this. For Picasa see here. You will need at least version 1.59 of Photonic for this. Google Photos see here. You will need at least version 1.68 of Photonic for this. Following the instructions, head over to Photonic → Authentication. For the provider that you want to authenticate for, click on the button to “Login and get Access Token”. Upon clicking “Save Token” the token and secret will be saved to the respective options page, and you will be taken there. 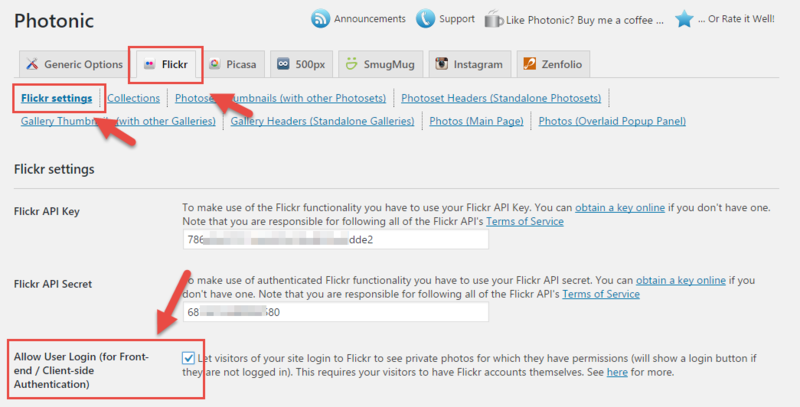 Note that both, the token and the secret are required for Flickr, SmugMug and 500px (it is an OAuth 1.0 requirement). You are now all set to display private photos to all your visitors. Note that Picasa has a specific setting for this. Flickr, SmugMug and 500px use OAuth 1.0 for authentication and OAuth 1.0 tokens don’t automatically expire. This is documented explicitly for SmugMug and in various groups for Flickr. There is no explicit documentation available for token expiry for 500px, but given the authentication protocol, the tokens can be assumed to have no expiry. True to form, Instagram says that the tokens expire, but doesn’t say when, passing the buck to you. You will have to keep monitoring your site to see if your token is active. Based on what I have found on the web the validity is at least 6 months long. Google’s approach is interesting – it issues you with a “Refresh token”, which you exchange for an “Access token”. The refresh tokens never expire, but the access tokens expire every 30 minutes or so. To take the sting out of reentering the access token every time, Photonic stores the refresh token and automatically pulls the access token for you if it has expired.